My husband and I met 9 years ago. He is from East Serbia and I grew up in the northern part of Serbia, in Province Vojvodina. It’s a big difference between Bor and Sombor, and not only in distance,which is almost 500km. There is difference in mentality, nature, customs, as well as in cuisine. 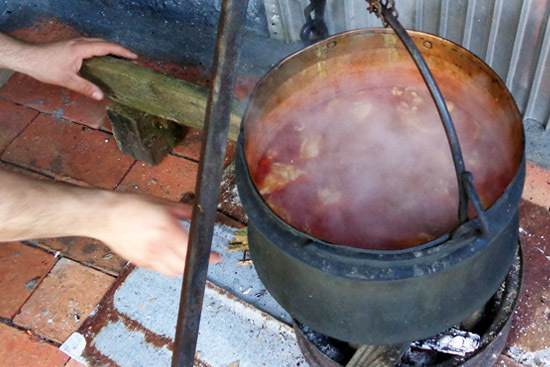 In Vojvodina there is a long tradition of preparing stew (in Serbian: paprikash). Stew could be prepared of different kinds of meat: chicken, beef, venison or fish. Since river Danube runs close to Sombor and this region, the most popular is fish stew. The main ingredients for stew are: fish or meat, tomato, onion, paprika powder, water and spices. Somebody may add potato. The stew is usually prepared for some special occasion, when family and friends get together to celebrate an important date for family. The main chef is mostly the man of the house and he prepares it in a fish-pot outside in the yard. This ritual of preparing outside gives plenty of time for telling jokes and making laughs. Woman is preparing the noodles and salad (fresh or brine, depending on the year’s season). The best noodles are definitely homemade noodles. A lot of competitions all over Vojvodina confirm how important this meal is. One of that kind is being organised in Sombor. The traditional competition “Sombor-pot” is held every year in the middle of July on the main square. More than 2000 participants enjoy in this ritual of preparing the best fish stew. At the same time there is a competition for the most beautifully decorated table, where ladies have chance to prove themselves in decorating. This year Sombor-pot will be held on 16th July and it’s a jubilee, it all started 20 years ago, and yes #YourSerbiaHost will be there, of course.